When you think about how much Facebook knows about its members, it’s remarkable how little many people know about how their data is tracked online. In a new PEW survey, 74 percent of Facebook users had no idea that their Facebook “ad preferences” page may have a relatively extensive collection of their traits and interests. And more than half of these same users, 51%, said they were unhappy with how much information the site tracks as revealed by that page. This survey seems to prove the essential premise behind Data Privacy Day, which takes place on January 28th of 2019. Is it even possible to maintain data privacy online? Using Facebook is a choice and it’s very difficult—but somewhat possible—to do so and keep control of your privacy. Google collects similarly vast amounts of information. And when it’s synced up to your offline activity through your phone number, you can be profiled in ways that many of us would not like to imagine. Let’s say that you do everything you can to avoid tracking. You never join Facebook. You never create a Google account. Heck, you even use Duck-Duck-Go. Your data must be safe then. Like every breach, this revelation has prompted calls of “Change your passwords!” But in a world where people practiced smart privacy that call would simply be “Change your password!” SINGULAR. Reusing passwords for your accounts multiplies the danger of every breach. Simply said: Reusing passwords is an invitation for criminals to violate your privacy. This is why for Data Privacy Day we are focusing on our favorite tip. We even made a t-shirt with it on it. And we want to give 5 of them away. All you have to do to win is to tweet your favorite Data Privacy Tip with the hashtag #MyPrivacyTip by the end of Data Privacy Day on the 28th. We will pick 5 winners randomly by replying directly to your tweet with the @FSecure Twitter account. 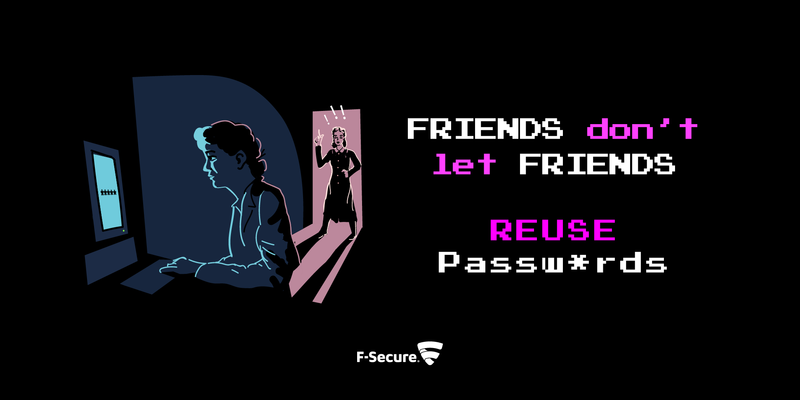 If you don’t feel comfortable sharing your tip, you can just repeat ours — because unlike passwords, this tip protects you even when you reuse it. Yes, this does require a Twitter account to enter, but it can be a dummy Twitter account with zero tweets. Your choice. No purchase is necessary. You can only enter once. If you enter, you’re granting us permission to use your tip and username on this blog and our social media accounts with permission granted for us to edit your tip. And any attempt to game this sweepstakes will result in immediate disqualification. You must post your tweet by the 11:59 PM EST on the 28th of January and respond to our tweet telling you that you have won within 7 days. Oh yeah, if you enter we will never bother you about this or use your data for anything again—unless you win. Because that’s the least we can do when we’re discussing data privacy. Quitting the Big Five tech companies: could you handle it?